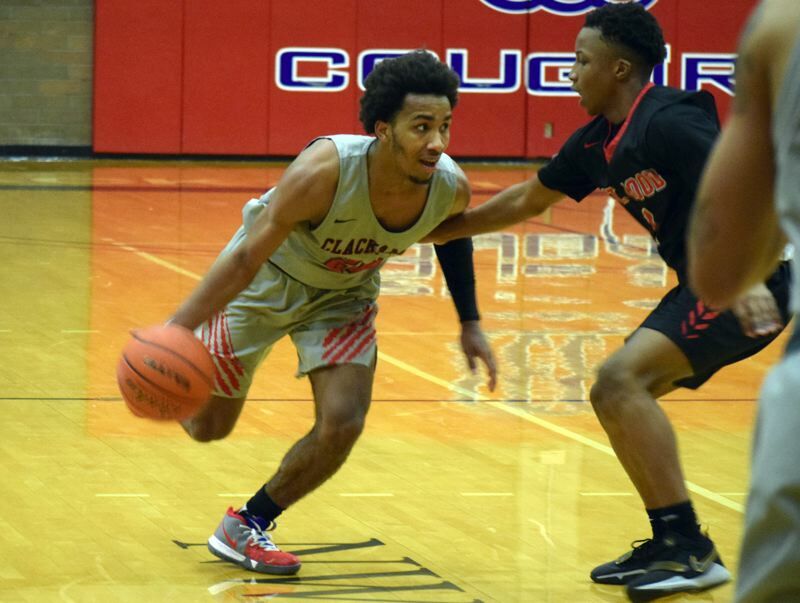 Clackamas Community College point guard Robert Ford did a little bit of everything for the Cougars on Wednesday night. Ford broke loose for 25 points, 12 rebounds, and 12 assists -- his fifth triple-double of the season -- to pace the Cougars to a 99-88 Northwest Athletic Conference men's basketball victory over the Mt. Hood Community College Saints at CCC's Randall Hall in Oregon City. Clay Sullivan added 21 points for Clackamas and three other players scored in double figures as the Cougars (14-6, 4-4 NWAC South) closed out the first half of league play tied with Clark College for fifth place. "It was a good win for us," Cougars coach Clif Wegner said. "Any win this time of year is a good win, but this puts us back up in the middle of the pack and within striking distance of a playoff spot." Mt. Hood's Kahlon Whitley led all scorers with 27 points and Kyler Haynes chipped in 21 points and a team-high 10 rebounds for the Saints (6-13, 1-7), who lost their seventh in a row. "The first half was our nemesis," said Saints coach John Rawley, whose team trailed 52-43 at the break. "I just don't think we played very hard defensively and then we didn't execute what we were trying to do on offense. "The second half, we came out with a lot of energy and we executed the offense better and got great, open looks. We just didn't knock some shots down." There were five ties and five lead changes before Mt. Hood's Carter Arrasmith set up Haynes for a jump shot that gave the Saints a 29-28 lead with 9:17 to play in the first half. Clackamas answered with a 22-9 run that started with a Sullivan 3-pointer (assist Ford) and ended with an Elliott Hesse lay-up (assist Ford) that put the Cougars on top 50-38 with 2:02 remaining in the half. The Cougars pushed the lead to as many as 13 points twice in the second half -- the second time when Adam Gehrig scored on a lay-up with an assist from Ford to make it 66-53 with 15:40 to play. Mt. Hood crept back within four on a pair of Marcus Greer free throws that cut Clackamas' lead to 73-69 with 10:49 remaining, but three minutes later, Tariq Harris knocked down a jumper at the end of an 11-5 run that made it 84-74. The Saints never got closer than seven after that. "Down the stretch, we didn't play defense," said Whitley, Mt. Hood's sophomore point guard. "We've got to get stops and we've got to get buckets. We can't just keep traded buckets when we're already down. That's going to make it harder to come back into the game. "We're on a losing streak simply because we're not executing down the stretch and not playing defense. We've lost a lot of games against teams we should have beat. We've got a talented team, but it's just us playing together as a team." Clackamas has led some second-half leads slip away this season (see Saturday's 100-99 heartbreaker at Lane), but there was no catching the Cougars on Wednesday, especially with Ford playing near the top of his game. The freshman point guard out of Portland's Jefferson High School kicked his game up a notch in the second half when he scored 17 of his team-high 25 points on 3-for-8 shooting from the field and 10-for-13 shooting at the free-throw line. "I couldn't do it without my team," said Ford, the freshman point guard from Portland's Jefferson High School. "I'm just trying to do whatever I can to help us win. "Overall, I feel like we came out, we played strong, and most importantly, we played together. After Saturday, that loss really got to us and we wanted to come out and play just as hard as we could." Jamie Stull scored 12 points off the Clackamas bench, while Gehrig finished with 11 points and Harris added 10 points, seven rebounds, four assists, and some stellar defense. And then there was Ford, who final scoring line showed 6 of 12 shooting from the field, 3 of 7 from 3-point range, 10 of 13 at the foul line, 12 rebounds, 12 assists, five steals, one blocked shot, and four turnovers. "Rob Ford is playing fabulous basketball," Wegner said. "I don't know what else to say. It's huge to have a point guard that's smart and makes good choices and can take care of the ball and step up and make pressure free throws. "He's just been playing at such a high level. I just pray that it keeps going and he keeps playing that that level, because I've had some great point guards that went on to play Division I, but nobody has put up these kinds of numbers this late in the season." For Mt. Hood, Arrasmith was the only other player to score in double figures with 13 off the bench, while Vlad Katin and Devin McShane added eight points each. "I wouldn't say it's frustrating," Whitley said of the Saints' recent woes. "I'd say it's a learning experience for me, for us. It's just a fact, though, day in and day out, we're the underdogs in every game. "That's what I tell my guys like, nobody expects us to win because we're on a losing streak, so we've just got to go out there and play free, play confident. Ain't no need to play nervous. Ain't no need for none of that. We just gotta come out, we gotta play hard." Mt. Hood CC (88) -- Kahlon Whitley 27, Haynes 21, McShane 8, Katin 8, Greer 6, Hall 2, Howard 3, Arrasmith 13, Farmer, Smith, Forrar. Clackamas CC (99) -- Robert Ford 25, O'Brien 8, Sullivan 21, Harris 10, Gehrig 11, Escalante 5, Hesse 6, Stull 12, Nchekwube 1, Lyubchenko.